Wharfinger in South West England is a perfect choice for a great holiday or a fun short break in Cornwall. Find out more about Wharfinger below. An open driveway with parking for one large or two small cars leads to the entrance porch with space for beach clothes or coats leading into a welcoming inner hall. The ground floor provides two sitting rooms: the one at the front has a gas fire set in a marble hearth for cosy spring or autumn evenings and a bay window looking across the canal with oblique views of the beach; the sitting room to the rear has patio doors leading on to a small terrace and steps up to the garden as well as a double sofa bed for extra sleeping accommodation by prior arrangement. Carpeted stairs lead up from the hall to the first floor bedrooms. The stairs divide at the top and to the right are two twin bedrooms; to the front looking over the canal and to the rear overlooking the garden and parish church with French doors to a small railed balcony. To the left of the stairs the front bedroom has a 5ft double bed and an attractive bay window facing the canal; the rear bedroom has twin beds, a vanity basin and views over the garden. From the landing there are three steps down to a spacious upstairs bathroom WC with shower over the bath and wash basin.Â The rear garden can be reached by several quite steep steps from a terrace accessed from both the breakfast room and rear sitting room. The garden has a paved area suitable for outside dining,Â and a pleasant expanse of lawn with an attractive central tree. For returning customers,Â the garden layout has beenÂ altered to accommodate a new detachedÂ cottage at the top of the garden. For parties of 4 or less wishing to book the property outside of the period 1 May to 11 September and the Spring, Autumn and Winter holidays please contact our office for an under occupancy reduction. Wharfinger is family friendly self catering. We have the following details listed regarding Wharfinger accommodation accessibility but we would recommend that you always confirm these prior to booking with the owner or operator. Wharfinger is a great base to explore the wonders of Cornwall and you will find plenty of activities near by. Wharfinger is at Bude, Cornwall. Check out the map below for directions, use the controls to zoom in. "Wharfinger is the best equipped property we have ever stayed at and is very comfortable and spacious..."
"Wharfinger is ideally located close to beach, shops and restaurants. It offers everything you need for..."
"Fabulous property, perfect in every way." "A wonderful family cottage holiday home, close to all the attractions of Bude, but peaceful and quiet..."
"This was the best property that we have stayed in. Excellent." If you have stayed at Wharfinger why not add your thoughts, comments, pictures to our Facebook page? Don't forget to add the name/town/page link to your comment so its attributed to the correct place. Please keep it polite, we are sensitive souls! Find Cottage Holidays works closely with independent cottage owners and leading holiday travel operators to provide you the widest choice of self catering accommodation across England. 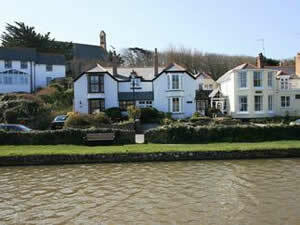 Wharfinger in Cornwall is available through: Cornish Cottages.